On a hot afternoon like today, I wish I could head back to my German hometown and stop by the local ice cream place for an “Eiskaffee”. It’s a sweet, delicious take on iced coffee. It’s quick and easy to make and the end result is more of a sweet treat than a beverage. Perfect for a hot summer afternoon. You can just as easily turn this into a treat for the kids by making an “Eisschokolade”. Just replace the coffee in the recipe below with chocolate milk. Scoop the ice cream into a tall glass. 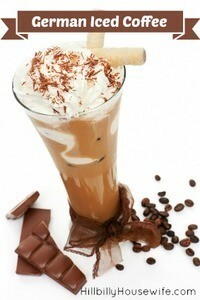 Pour the cold coffee in and top with whipped cream. Add a sweetener of your choice if needed. I find the vanilla ice cream sweetens up the coffee enough for me. If you prefer it sweeter, either use an artificial sweetener that dissolves well in cold liquids, or add a little sugar to your coffee while it’s still hot, then allow it to cool and use the sweetened version in your iced coffee. If you’re making this for company, consider adding a sprinkle of cocoa powder or instant coffee to the top of the whipped cream. Variation: Try making your german style “Eiskaffee” with chocolate ice cream instead of vanilla for a yummy Iced Mocha style drink.